Excellent 3-D images demand many comparison points of depth, as does a life lived in dedication to the genre. 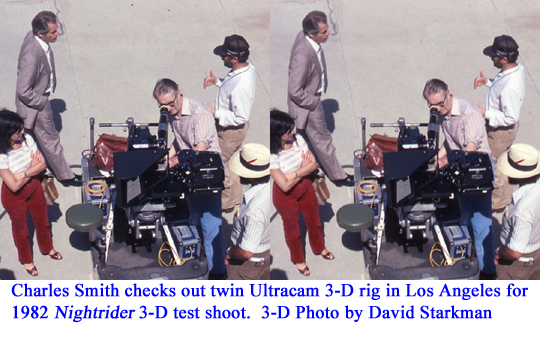 The career of Charles W. Smith FBKS FRPS, a technical expert in the field of stereoscopic transmission, has encompassed all aspects of 3-D, from still photography and cinema to camera construction and publications. A protégé of Raymond Spottiswoode, the British pioneer credited with having coined the term 3-D, Charles rode the crest of Britain’s 3-D cinema wave in the 1950s. After the trend cooled, he dutifully continued to tend its embers; throughout a career which spanned half a century, he did not fail to heed a summons to the third dimension. Born in Rugby, Warwickshire in the early 1920s, Charles’ interest in photography began early in life. His father owned a chemist’s shop with film developing and printing on the premises. At six Charles was already looking at the world through a lens, taking photographs of family life. His work as a technical assistant began when he was twelve and grown-ups would come into his father’s shop to ask him for advice about their cameras. Charles was a member of the Photographic Society at the Warwick School, which he attended from the ages of eight to seventeen. The road to 3-D appears in many guises, and Charles’ path was set to music. Even though as a young adult Charles owned a stereo box camera, his chief passion in life was not stereoscopy, but American jazz. Charles’ search for the grail was to attend a performance by the blues pianist Meade Lux Lewis. In August of 1939, at the age of nineteen, he booked a third-class ticket on the Queen Mary bound for New York. Gotham was sweltering. Most of its resident jazz musicians were cooling off in the countryside, but Charles managed to track down Meade Lux Lewis at one of the few clubs where black and white audiences were allowed to mix. This accomplished, he turned his attention to the 1939 World’s Fair. 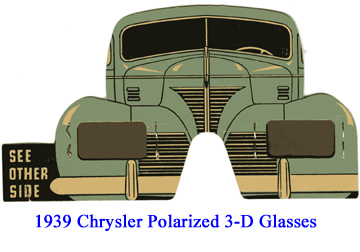 One of the first 3-D films, “Motor Rhythm”, made by John Norling for Chrysler Cars, was on offer, but the cinema in which it was being shown was surrounded by a spiraling queue. Unaware that in twenty years’ time he was to become a professional in the field of stereoscopic cinema, Charles bypassed the opportunity and went instead to Salvador Dali's’s Dream of Venus. He was launched from the Dali pavilion into the fray as he alighted from the Queen Mary, three days after the opening salvos of the Second World War. Exempted from military service after having a lung abscess, he dug out at the British library. Ragtime jazz had yet to be marketed in Britain, and Charles dedicated himself to copying by hand some of the unpublished compositions of Scott Joplin. His efforts bore fruit beyond his expectations when a young lady called Ena visited his flat and discovered the scores. Unaware that she was a skilled piano player, it was to Charles’ considerable astonishment that he heard Joplin’s Maple Leaf Rag issuing forth while he was in the kitchen preparing tea for two. They were married in 1944, and Ena is still playing for him now, fifty-eight years later. Jazz was relatively obscure in Britain in the 1940s and Charles was its tireless advocate. He produced radio programs for the troops, reviewed albums, and wrote copious articles about jazz, which were published under the name “Charles Wilford”, his middle name replacing his surname. At the age of twenty-four Charles landed a new post as a documentary film production manager. The job was akin to a university of cinematography as Charles familiarized himself with all aspects of film production. His aim was to become a cameraman. After a couple of years he became an assistant to the Viennese cinematographer Wolfgang Suschitzky, acclaimed for his documentary stills of London in the 1930s. British documentary films of the time had a high reputation for technical quality, and for the social values expressed in them. Charles worked on films for Shell Oil, British Petroleum, the National Coal Board, and some of the medical companies. After the war ended, London arose like the phoenix to a sudden reversal of fortunes. The 1951 Festival of Britain heralded an era of optimism, and its purpose was to use the arts as a vehicle to promote British achievements. Blueprints were drawn for the Telekinema, a cinema to showcase new British films. At that time stereoscopic cinema was largely unknown to the world. It was the vision of Raymond Spottiswoode to use the opportunity to produce 3-D films. Mr. Spottiswoode, who would ultimately hand the mantle over to Charles, was British and had been working in Hollywood for MGM before the war. An Oxford graduate, a writer, producer, and a technical expert, he was employed by the National Film Board of Canada when he was asked to assume directorship of the Telekinema. When the festival opened, Great Britain became the first country in which feature stereoscopic films were shown to a general audience equipped with polarizing glasses. Four films were shown in the first program. Around is Around and Now is the Time to Put on Your Glasses were direct-drawing animations made by Norman McLaren of the National Film Board of Canada; A Solid Explanation took the form of a humorous lecture on stereoscopic principles; Royal River was a travelogue of the Thames, and the first 3-D travelogue ever to be shot in color. The program proved to be very popular indeed. As the Festival of Britain drew to a close, the four films continued to be shown in London together with newsreels. They were also distributed to other European capitals and to the United States. Given the unique requirements for stereoscopic projection, British advisors were dispatched abroad to provide guidance on running the projectors. Charles W. Smith was one such roving technician who went to Paris in 1952. There was strong impetus to further the production of stereoscopic cinema for commercial audiences, and this required a reliable camera. 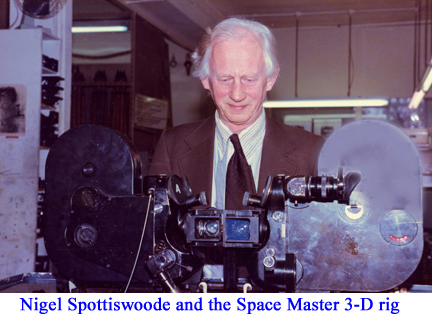 Raymond Spottiswoode and his brother Nigel, an engineer, established Stereo Techniques Ltd. with the aim of producing small-scale stereoscopic documentaries, and also of acquiring funds for building improved 3-D cameras. The first three films from the festival had been made with the BFI 3-D camera. Designed by Leslie Dudley, it was funded by the British Film Institute (BFI). Like all prototypes, the BFI 3-D camera was less than perfect. Its precision was rickety, and the film was constantly shifting. The BFI 3-D camera was inadequate for Royal River, so a new one was fabricated by mounting together two Technicolor three-strip cameras. The apparatus was so heavy that six men were needed to lift it. 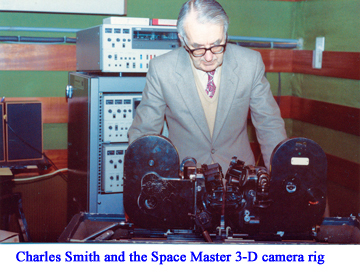 The BFI 3-D camera had to be completely rebuilt, and it was at this point that Charles became involved with the project. With Raymond and Nigel Spottiswoode, he authored the article “3-D Photography” which appeared in the October 1952 issue of the Journal of the Society of Motion Picture and Television Engineers. 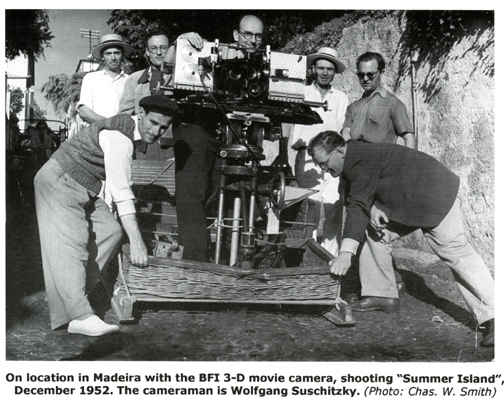 In addition to the refurbishment of the BFI 3-D camera, plans were being hatched to construct other cameras as well. The first film that was made with the overhauled BFI 3-D camera was about coal mining. Directed by Jack Chambers, Wolfgang Suschitzky was the cameraman, with Charles W. Smith as his assistant. Raymond Spottiswoode took charge of the camera settings, standing by the camera and measuring each shot for angular convergence. 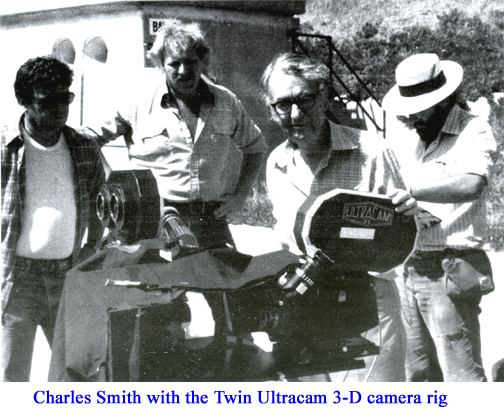 Raymond taught Charles how to set up the cameras, and invited him to take over the stereoscopic control of the rest of the films. Meanwhile in the laboratory, plans were underway to construct the ultimate stereoscopic cinema camera. The National Research Development Corporation (NRDC) provided the brothers Spottiswoode with a grant, the fruits of which ultimately became the gargantuan NRDC camera. It took an eternity to build and was finished in time to coincide with the end of 3-D as a popular medium. In 1953, however, 3-D cinema was still very much in vogue. It was the year of the Coronation, and money became available for the building of a new camera with which to film it in 3-D. The project had to be done rapidly since it was unlikely that the Coronation could be held off pending completion of the camera. Since the film was to depict scenes of life in Britain during the Coronation year, a chief requisite of the new camera was that it be light and easy to maneuver. It was decided to adapt a pair of French 35 millimeter Cameflexes, of high quality and lightweight, into a 3-D movie camera. Making this in England was out of the question as no English companies were doing that type of motion-picture engineering. Hollywood was the best place. Charles was invited to go to Los Angeles to act as a technical advisor. When Charles arrived, Raymond Spottiswoode had already been there for about two weeks, just long enough to be injured in a car accident. Consequently, he had to shorten his stay. Spottiswoode limped around and introduced Charles to the various people who were working on the project, then left him there to finish it. 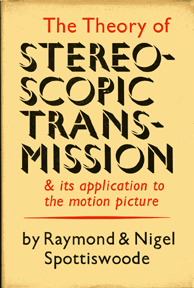 In addition to the camera, Charles’ duties came to include proof-reading the technical information in The Theory of Stereoscopic Transmission and Its Application to the Motion Picture, a volume written by Raymond and Nigel Spottiswoode, published in Berkeley in 1953 by the University of California Press. Charles’ job was to test for image-alignment accuracy. The biggest problem in building lenses was to get them to focus to infinity. Lens mounts were the vital feature. The Richardson Camera Company of North Hollywood undertook to build the stereoscopic lens mounts, each of which had to carry the lens in two directions at right angles to control the focus and convergence. The mounts proved nearly impossible to build, the main problem being to keep out stray light. 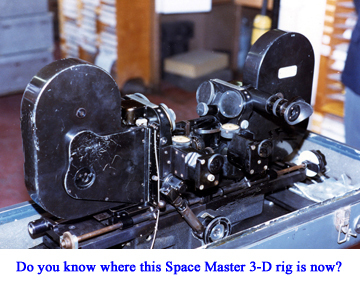 The work took three months to complete, and the new camera was christened the Space Master. A lovely crate was made to house the Space Master for its journey to England. Charles and the camera had to travel on separate planes, with a stopover in New York. It was to Charles’ considerable relief that the Space Master made the journey without incident, a week before the Coronation. Royal Review was technically outstanding, but unfortunately not a box office success. Two color 2D films had also been made of the Coronation, and these were released first. By the time the 3-D offering was ready, the public was already sated, and the novelty of the medium had worn off. The boom of 3-D cinema fizzled. As British stereoscopic cinema entered a dark age, Charles W. Smith remained dedicated to tending its embers. He continued to earn a living within the realm of two-dimensional cinematography, in what became the best part of a thirty-year career at World Wide Pictures. His responsibility to his family and his day job notwithstanding, Charles was still compelled to heed the summons to 3-D when it arose. In 1961 Charles took a leave of absence in order to bring the Space Master and the NRDC to Toronto for a Warner Brothers 3-D horror film entitled The Mask. It was winter and he had to travel by boat to Halifax, Nova Scotia. Once there he and the cameras had to continue the journey by train. The NRDC had been made even bigger by the material used to pack it, and a team of lifters was needed to load it onto the train. Charles had a large sleeping compartment, which was adjoined to the one in which the cameras were housed. A blizzard struck, but the railing was efficient, and the train proceeded smoothly. Charles had dinner and then slept soundly. He awoke to find that the train was plowing through snow-covered fields. It was the biggest snowstorm in the area for thirty years. The train was not due in Toronto until midday, so he went to the dining car for breakfast. On the way back he decided to check on the cameras. He tried the door to the goods compartment, but it would not open. The conductor told him that during the night the train had been separated, and that the carriage with the cameras in it had gone ahead. Then he told Charles not to worry. The camera would be waiting for him on the platform. When he arrived, the NRDC was there, but not the Space Master. He had to hunt around the station for the original wagon. Finally he found it. The Space Master was the only thing left in the carriage; it was on a shelf, completely unguarded. Charles got it and no one interfered with him. Essentially, anybody could have taken it. Having finally gotten the cameras to Toronto, Charles was greeted and told that the art director had just been dismissed. This caused a delay as the plans had to be re-made, thus turning a six-week project into twelve. After the death of Raymond Spottiswoode in 1970, Charles and a colleague founded a company called Stereo Image Techniques. 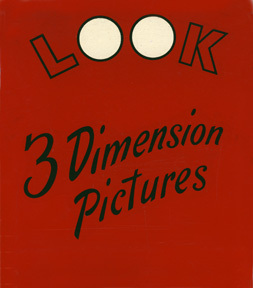 The main focus of the company was 3-D cinema, but they did still 3-D photography as well. 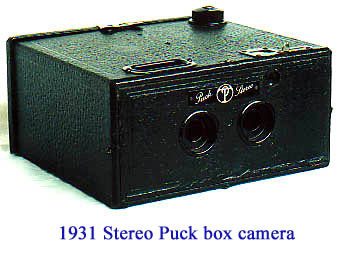 They built a camera for stereoscopic stills, designed for automatic mounting without tiresome after-corrections. Built according to Charles’ specifications, it was made in Deventer, the Netherlands. Its first production use was for a presentation for Volkswagen at the Belfast Motor Show in January 1981. This was thought to be the first commercial 3-D slide show. Charles laments that during the fifty years since the Festival, there have been few significant advances in 3-D cinematography. In Moscow in 1976 he saw a thirty-second holographic film of a girl picking flowers, and in 1980 attended the 3-D film festival in Berlin. Nothing seemed to suggest the advent of an era of distortion-free 3-D cinema with comfortable viewing. Raymond Spottiswoode made great leaps in only fourteen months. Charles believes that had the funding been available to allow the field to develop, the results would have been extraordinary.